A ground cover shrub with tiny, light green, needle-like leaves. 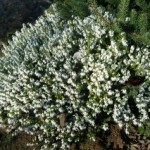 The white urn shaped flowers appear in January through April. It is tough and fast growing. Great in mass planting. It prefers an acidic, well-drained soil and full sun. Shear lightly after flowering to maintain a tidy form.